Why Does My Ingrown Toenail Keep On Coming Back? There are several reasons for this. First of all, how was the ingrown nail treated? If it was treated by just cutting it back to relieve the pressure, then in probably about 6-8 weeks you will have the pain again. 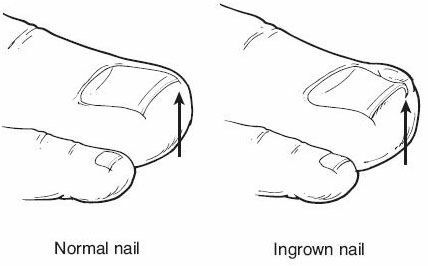 You see the nail becomes ingrown because there was damage to the root of the nail, which lies under the cuticle. This now damaged root keeps on making a new ingrown every time. So, in order to remove an ingrown so it never comes back, a minor procedure must be done. This is where the toe is anesthetized using a local anesthetic. After the toe is numb, the ingrown nail is removed. Not, the whole nail, just the part that lies under the skin of the toe. Then, a chemical, usually 89% phenol, is applied in the corner of the nail groove using a Q-tip. This chemical is used to kill the root that makes this ingrown. In over 90% of the time, this method is effective in preventing future ingrowns. Without the chemical, you can just circle the date six months from now, and you will see a new ingrown. Sometimes the chemical will not take, so the doctor can try and do the procedure again, or remove the root surgically, which requires stitches. This is usually not necessary as the chemical is highly effective. Care of the toe after the ingrown removal is cleansing the area with a wound wash and applying an antibiotic ointment twice a day. Sometimes an oral antibiotic is needed. So, stop cutting your nails into the corners. Cut them straight across and file them round. If you do have an ingrown, then come our office to get out of pain (732) 968-3833 or (908) 874-8030. Did you know we offer New Patients a Free Exam with our doctors? Come into our office, at NO COST, and meet with one of our highly trained doctors. You can discuss your problem, have the doctor take a look and discuss treatment options before you have to pay! Call (732) 968-3833 OR (908) 874-8030 to Make Your Appointment Today. Owner of Family Foot & Ankle Specialists in Piscataway and Hillsborough, NJ. Make an appointment today! Fill out the short form below and we’ll contact you within one business day for your free, no-obligation consultation. ?How Can I Fix Dry, Cracked Heels? ?How do I know if I have Nail Fungus?